CollaSorb® Sterile Collagen Wound Dressing is ideal for managing acute and chronic wounds. It is composed of 90% pure collagen and 10% calcium alginate. It contains sterile non-cytotoxic bovine derived collagen. CollaSorb® rapidly absorbs exudate and is capable of absorbing up to 30 times its own weight. It is easy to cut and apply. Collagen improves binding of matrix metalloproteases (MMP's). It creates and maintains a moist wound environment, promotes optimal healing and extracellular matrix formation, and requires less frequent dressing changes. It remains in direct contact with wound bed when totally saturated. CollaSorb® is ideal for managing acute and chronic wounds with light to heavy drainage. A foam may be used as a secondary dressing for heavily draining wounds. For moderately draining wounds cover with an appropriate secondary dressing such as FlexiCol® or Cosmopore® Adhesive Dressing For minimal exudate, cover with a non-woven retention tape such as OmniFix®. 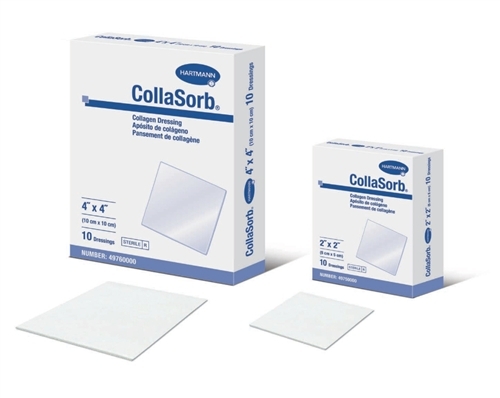 Collasorb® is sterile and individually sealed. Available in two sizes - 2" by 2" and 4" by 4".